This post, A for Arni, would have come on tops irrespective of how this blog was organized – alphabetically or chronologically. 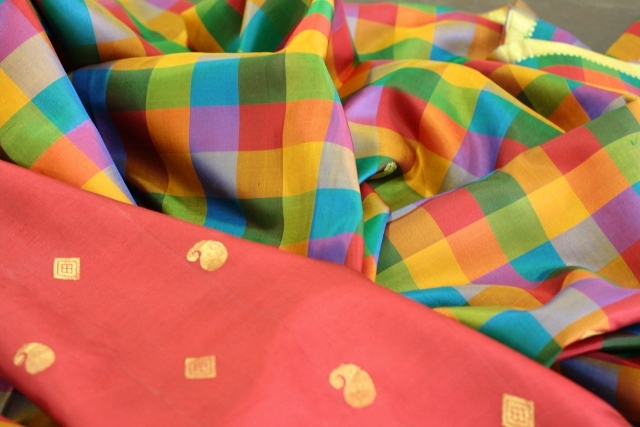 The Arni saree is named after, well, Arni – a small town in Tamil Nadu. Though only an hour-long jaunt from Kancheepuram, it is not as high-profile, but boasts a silk weaving culture that is just as old. Say hello to the illustrious dynasty of Tamil Nadu sarees which I have so far, unknowingly and unintentionally generalized as Kanjeevaram (Kancheepuram) sarees. The Arni saree, an important member of this family, carries the genes of this dynasty and also boasts its own distinctiveness. Before I launch into a description of this saree, this piece of history is essential to understand the origin of the Arni. I must add here, that in all the reading on the origin of different sarees I have done so far for this blog, nothing has fascinated me as much as this piece of history. Approximately 1200 years ago, there lived a people in Saurashtra, on the coast of North Gujarat. The Saurashtrans, it is told, could weave cotton into a fabric as fine as ethereal as silk. Their expertise was not restricted to weaving but to all forms of textile art – printing, dyeing, embroidery and resist dyeing. They were a god-sent in a land already rich with cotton crop. Soon a royal charter named them ‘Pattavayahs’ – which means ‘weavers of silk-like clothes’. All was well for the Saurashtrans until about 1000 AD, when Mohammed Ghazni invaded these lands. Mass destruction and looting that followed forced the Saurashtran weavers to flee these cotton-rich lands in large numbers. Their flight from this land took them to other parts of the country over a period of two centuries. To begin with, they settled in the interior regions of present day Maharashtra for about 100 years. Here they co-created the magnificent Paithani weave together with the local weavers. Moving on from here, they went to South India in large numbers and settled in Vijayanagar where they were patronized by the royal family. With the fall of the Vijayanagar empire (and subsequent loss of patronage) they moved in large numbers to Thanjavur and Madurai. The Saurashtran weavers arrived into an already thriving weaving culture in Thanjavur and Madurai. They lent their weaving, dyeing and printing skills and propelled the art of weaving to dizzying heights. Such was the glory of both the art and the artist, that weavers were one of the most prosperous communities of those times. Prosperous enough to donate land for religious and social activities! Now not all Saurashtrans settled in Madurai. A large number of families also moved to other villages and settled in the neighbouring towns of Kumbakonam and Arni. 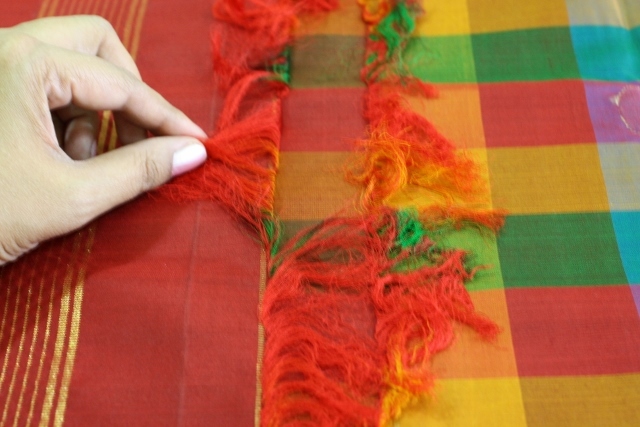 Over time, these settlers lent their skill to create a saree style that was distinct but had its roots firmly embedded in the existing traditional patterns. The Arni and other Tamil Nadu sarees like the Kumbakonam and Kanjeevaram are the carriers of the historic Saurashtran legacy. Today the Saurashtran weavers are considered amongst the most skilled weavers in the Tamil Nadu silk weaving communities. While they have preserved their religious roots, their integration with the Tamil community is deep and complete. The Arni saree is a bright, colourful rich silk saree that retains its ‘South-Indian’ look owing to its bright jewel colours, gold zari work and typical motifs. It also however has its own distinctiveness. The most distinctive feature of the Arni, is its interlocking border – the ‘korvai’ and the contrast pallu. This, confusingly, is also the most distinctive feature of the Kanjeevaram. So what tells the two types apart is the light-weight feel of an Arni. The image below shows a distinct saree and pallu interlock. The Arni saree also has interesting new colour combinations – like maroon and black or rust and blue. 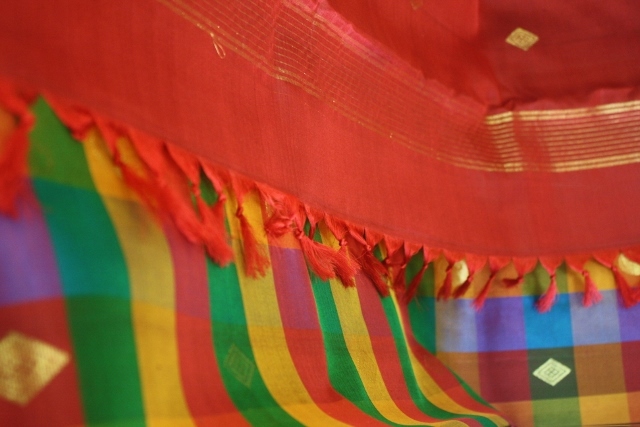 The Kanjeevaram saree usually carries more traditional colour combinations like maroon and yellow or red and green. And now for that one feature for which I love Arni sarees, the checks pattern or the ‘kottadis’. 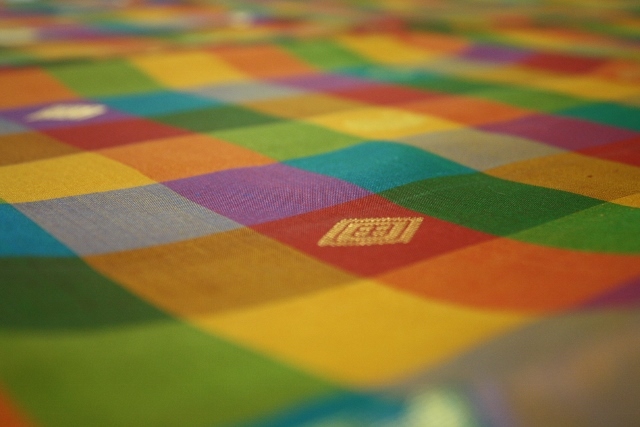 Now checks and stripes are a traditional design pattern and can be found on any saree, chances of finding full check patterns on saree are a distinct Arni feature. The Arni checks are of different sizes. There are the really small checks called ‘kasa-kasa kattam’ or ‘khus-khus’ (poppy seeds). So small that a black-and-white checks pattern creates a grey tone effect. Then there are the slightly larger ‘puliyam-kottai’ or tamarind seed checks. And finally really large checks called the lungi checks or ‘kerchip’ (kerchief) checks. Now how about loving a saree for its name? 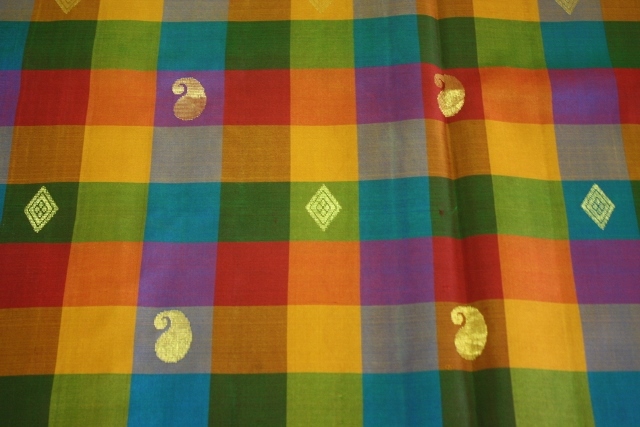 The saree shown below has checks called the ‘paalum-palamum kattam’ or milk and fruit checks. The saree I have shown here does not have a typical border like a Tamil Nadu saree but has a thin gold border instead. So is it a real or original Arni saree? It may be or it may not be. What is important for me is that the saree has a character distinct to the Arni saree. And I love it just the same!